Those of us old enough to remember Total Quality Management movement of the 1980s will see the direct relationship of the proposed PDCA process and Demming’s PDCA cycle of Continuous Improvement. However, those of us who were heavily involved in the TQM movement also remember that the PDCA Cycle can have serious unintentional consequences when incorrectly implemented. I hope that history is not about to repeat itself with the new HSG65. Dr. J. Edward Deming, the famous quality guru, provided a simple yet highly effective technique that serves as a practical tool to carry out continuous improvement in the workplace. This technique is called PDCA Cycle or simply Deming Cycle. PDCA is acronym of Plan, Do, Check and Action. PDCA Cycle provides conceptual as well as practical framework while carrying out Kaizen activities by the employees. The essence of the PDCA cycle lies in employee involvement. This happens when they improve their process, product or services by applying their creative faculties on their work related problems and routine jobs. Kaizen (Japanese word meaning continuous improvement) provides these employees a platform to unleash their creativity. The four steps Plan, Do, Check and Act should be repeated over time to ensure continuous learning and improvements in a function, product or process. PLAN stage involves analysing the current situation, gathering data, and developing ways to make improvements. The DO stage involves testing alternatives experimentally in a laboratory establishing a pilot process, or trying it out with small number of customers. The CHECK stage requires determining whether the trial or process is working as intended, whether any revisions are needed, or whether is should be scrapped. The ACT stage focuses on implementing the process within the organization or with its customers and suppliers. Once all this stages are completed to the fullest satisfaction, the improvement is standardised. The standardised work or product is the result of improvement initiative but it is not stopped here. 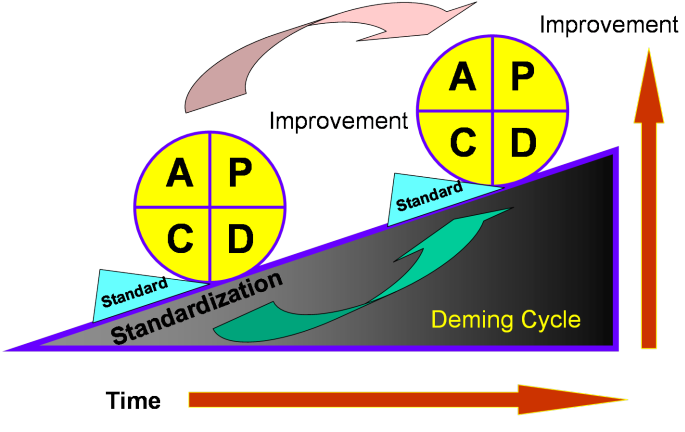 With the changing circumstances or new techniques this standardised work, process, product or service is again subjected to further improvement thus repeating the PDCA Cycle again and again. In theory the PDCA Cycle is an excellent ideal but there can be unintended cnsequences when its importance becomes greater than the process it is monitoring for improvement. The worst question in the programme has to be when management ask “How do we know we are improving?” Then we create the wedge of administrative destruction. Time, Money and Effort all focus on feeding the admin system. Production is lost, safety is compromised and businesses become unprofitable. Avoiding the bottomless admin pit requires a focus on ‘Doing the Right Things Right’ and keeping a perspective on what is required. Below are a few hints as to what you will need to do within your organisations. Planning is the stage in the PDCA process which is most often overlooked when people are rushed to get something done. But beware! You overlook planning at your own peril! Follow the steps below to help with your planning process. Review your current philosophy, purpose, strengths, and situation! Define your am, and set your specific goals! Decide if you are ready, willing, and able to commit! Design your process, determine your priorities, resources, and timeline! After planning, it is time to move to the execution stage of the Plan, Do Study, Act cycle. It is time to do whatever your “it” is. Focus, Coordinate, and Control Your Performance and Document your Results! Focus your performance. The great management guru Dr. W. Edwards Deming wrote that constancy of purpose is one of the key ingredients of success. Know where you want to go, and stay focused on performing activities that serve to further those goals. Coordinate your performance. You do not work in a vacuum. And you are not serving your organization by personally succeeding at the expense of others or at the expense of the goals of the organization. All work must be coordinated to produce maximum benefit for the organization. Control your performance. Work within defined and accepted parameters to make sure you are in compliance with health, safety, and other regulations. Document your results. Remember – if it isn’t documented, it isn’t done! Without proper documentation, you won’t be able to carry out the next stage – Check! Preferably on a small scale. This is still an early stage in getting “It” done. Don’t commit more resources than necessary until you have completed the PDCA process at least once. You still need to decide whether or not your methods were successful in this stage before you ramp up. Cecking, the third phase of the Plan, Do, Check, Act process, requires us to look at what we have done, and evaluate it Did it accomplish what we expected? Were there unintended consequences? Is there a better way we could do it next time? In order to answer these questions, we look at the system, and evaluate it and its outcomes. We measure data and variation using statistical processes. Control charts are tools used to determine whether or not a business process is in a state of statistical control. Integrate what you have done into your organization and implement it on a larger scale. This is done when your first attempt was completely successful, and you don’t want to change anything. Take corrective and preventive action. This is done when your first attempt was somewhat successful, but you learned from it and need to adjust the process. Abandon the idea. This is done when your attempt was completely unsuccessful, and you don’t want to integrate any of it into your business operations. There are different types of “acting” in organizations. When implemented as part of the PDCA cycle, “acting” is really “pro-acting” instead of “re-acting.” PDCA requires that we look ahead and anticipate what might happen, and prepare for it. People who take shortcuts with the PDCA cycle often end up in a “Do – Act” process, skipping the planning and the checking. This could really be renamed a “Do – React” process, whereby many resources are wasted.